Integrate LiveChat with ActiveCampaign to easily add emails of your chat visitors to the ActiveCampaign list. Thanks to it, you are given an opportunity to create a targeted campaign for customers who chatted with you. ActiveCampaign is an all-in-one marketing platform for businesses. It offers a set of tools designed to help small to medium-sized organizations acquire, retain, and engage their customers. The tool helps you find out more information about your contacts, lets you create emails and supports social media marketing. What's more, ActiveCampaign automates marketing and sales through marketing workflows and follow-up sequences, while also tracking behavior in multiple marketing channels. ActiveCampaign has a drag-and-drop email designer interface, along with free templates and image hosting. Once contacts have been uploaded to ActiveCampaign, the platform makes it easy to segment those contacts into individual lists. On top of that, the solution comes with such features as email split-testing, smart autoresponders, event tracking and the API. With our dedicated LiveChat plugin and user-friendly tutorial, you're only minutes away from automating your newsletter campaigns! Integrate LiveChat with ActiveCampaign and gather new subscribers straight from your chat. Every time a visitor writes their email in the pre-chat survey, the new contact will be added to your ActiveCampaign list. Thanks to it your subscribers list will grow faster than ever before. This integration offers an easy way to follow up with a customer with a giveaway to continue to build customer loyalty. Add a new contact in ActiveCampaign when a chat ends. It's a perfect way to gain new subscribers and extend your email campaigns reach. 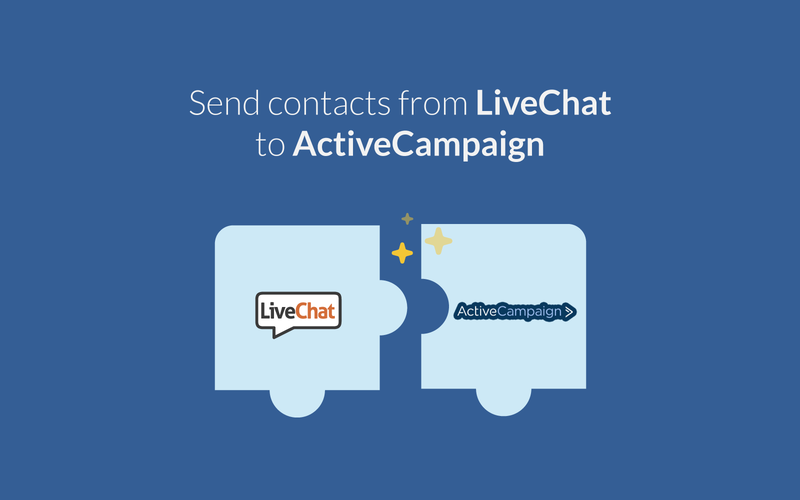 Start using LiveChat with ActiveCampaign now!